Making your children play outdoors can be pretty hard, especially in the modern age with television, the internet, and so many digital devices entering their life. Playing with the playhouse is a fantastic experience in every way. It is safe, fun, easy, and can be done with several other kids at the same time. You just need to get your kid, place the playhouse outdoors, and let him/her play without any interruption. And if you want a better experience for your child, bring siblings or friends to the equation, it will be even funnier. So, do you want to know more about the best outdoor playhouses available in the market? Then come further and learn everything you need to know and more! Picking the best playhouse is not an easy job. There are not only thousands of playhouses in the market, but also many confusing & misleading options. To help you pick the right one, here are ten of the best playhouses available out there. Why Should You Invest In a Playhouse? What to Know Before Buying a Best Outdoor Playhouse for Kids? The Step2 Neat and Tidy II is a perfect playhouse for demanding parents. Not only it comes with all the details you could ask for in a playhouse, but also with one of the most secure and most durable constructions out there. The playhouse is open as well, so it helps children see outside and parents to be aware of what’s happening inside at all times. And to make it even better, it allows up to three 1 to 4-year-old kids to fit inside without any issue. The design of the Neat and Tidy II boasts everything for children to play with, from a fireplace, a wall clock, a play phone, a kitchen table, a faucet, a barbecue, to even a kitchen seat. In the outside, you get a lamp, a mailbox, a doorbell, and the little doorbell is not loud at all, so if your kid rings it over and over it will not drive you crazy. Your children will never run out of things to do with this playhouse, that’s for sure. But this is not all it offers. The Dutch door and shutters make it totally easy and safe to use as well. And the plastic build is one of the safest in the market, as well as one of the most durable. It can stand several hours under the sun without issues, sometimes even days. The best of all; it looks terrific and costs half of what other similar playhouses do. So you get a perfect product at one of the most affordable prices in the market. It has a floor so you can set it anywhere without worrying about what is underneath. Promotes a safe yet durable experience with the top-notch plastic build. 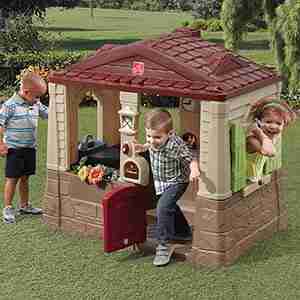 Comes with several items & decorations not many playhouses offer. Looks really good and enticing for toddlers. Not suitable to play while raining due to poor drainage. The Little Tikes is the perfect choice for children who want more than just one thematic. This one comes with four different faces, all of them with a different theme from a schoolhouse and firehouse, to a sports wall, a grocery store with a bank wall, and a gas station. It is easily one of the most creative playhouses in the market, perfect for children who want to improve their imagination exponentially. 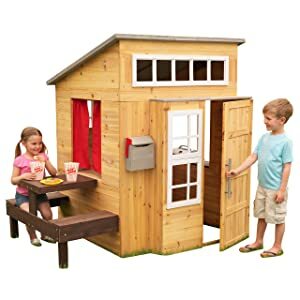 The playhouse also comes with several items as well, including a table and chalkboard, a soccer ball and a basketball, a gas pump with its own pipe, and a grocery store with a drive-up window and an ATM machine. If you want your children to fill with endless playing opportunities, this playhouse is the one you should go for. It promotes a more interactive playing experience, primarily when used with other children or with a grown up. You can help your kid even learn how different places work, including a grocery store, a bank, and even school or firehouse. For those who want to teach their kids to play sports at an early stage, the sports walls come like a perfect option as well. This playhouse is merely unbeatable when it comes to playing opportunities, and that makes it unique in its type and ideal for all kinds of children. Its very durable and can withstand harsh weather. 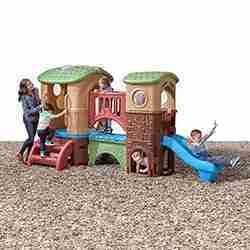 Exceptional four-themed playhouse for more playing opportunities. Enhances social & communication skills with different interactive faces. Helps to improve physical activity with sports wall and balls. Some users complain that the color is a bit of bland. A pink cottage is what every little girl wants to play with her friends. 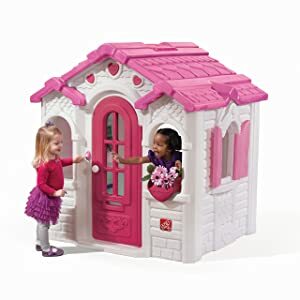 The Sweetheart Playhouse from Step2 is precisely that, a gingerbread house that comes with one of the most enticing and beautiful designs for girls playhouses. Not only it is gorgeous, but it is also very spacious and comes with a totally interactive design. It comes with movable doors and windows, as well as shutters, a decorative roof, an electronic doorbell with chime sound, and even an automated phone. Other additional items including a barbecue grill, a lock, and a decorative flower pot. Your little girls will have an amazing time with this house without a doubt. From a stovetop to a grocery stand, and more – it helps baby girls to have a fantastic time imagining being the owner of a beautiful house. And it fits up to three kids inside, which is perfect for tea parties, dinner parties, and a whole larger array of imaginative and role-playing activities. The best of this house is the ability to provide a very sturdy & reliable performance at all times. Its build even resists days outside without showing wearing or tearing signs. The paint is incredibly resistant, and every item or detail is totally durable. And because it does not come with a floor, you can transport this house back and forth without issues, making it not only highly reliable but entirely convenient. Beautiful and inviting Sweethard cottage design for girls. Large design perfect for role-playing and doing activities inside. A wide array of interactive items to play with. Highly durable, resistant and convenient build. Really hard to install and put together. Recreating a pirate boat, the ECR4Kids is a perfect choice for those who like marine activities. It will work for any type of kid, and it provides one of the most interactive designs in the market. When it comes to getting a playhouse that will entertain your child for hours, this one is an incredible choice. The design begins with bright colors, making it very enticing for children from 2 to 6 years to get on and play with it. And of course, it works in a wide variety of places, including gardens and sand plots, as well as indoors and other similar areas. This way, you get a product that will promote imaginatively and role-play to the highest standards. Not only because this pirate house looks impressive, offers a pretty versatile design and build, but because it comes with many interactive items and details for a perfect experience. 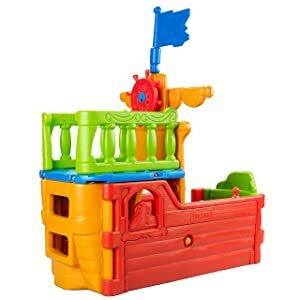 From a movable steering wheel to a parrot, a pirate flag, and even an anchor – this pirate playhouse has it all. The best of all, you get enough space for up to three children to play with it. It offers a room in the deck, in the helm and in the cabin. Children will have a complete experience for unlimited hours of fun. Even more so, when you consider its fade and weather resistant blow-molded plastic build, which makes it light but also highly reliable and long-lasting. One of the most attractive models out there with pirate boat theme and bright colors. Highly reliable & long-lasting construction with blow molded plastic. Spacious and interactive design for unlimited playing hours. Can be used for both indoors & outdoors. Easy to put together, no tools required. Pieces can come off pretty easily including interactive parts like the flags and steering wheel. One of the largest playhouse you can get for the price, the Neighborhood Fun Center from Step2 is an excellent choice in its entirety. 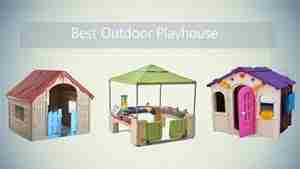 It is also one of the best outdoor playhouse for toddler on today’s market. This house comes with a slide and an activity wall. The slide will help any adrenaline-driven child to start going on dangerous adventures, while the activity wall helps toddlers to develop better and sharpened motor skills. When you add the built-in picnic table and the seats, you get a highly versatile playhouse for children of all ages. It works for any kind of improvement, whether it is physical, communicative, or social skills – this playhouse works wonders. You will even get two balls and four rings so kids can have an even more complete experience with it. Add the Dutch door entrance and the crawling portal, and you get an amusing toy that will entertain children for hours without stop. Perfect for children between 2 and 5 years old, this playhouse is an option you shouldn’t overlook. It will quickly become a favorite toy for your children, and it is durable & reliable enough to be used practically anywhere. So you won’t get many options as good as this one. Excellent design for a wide array of activities and playing opportunities. Additional interactive wall and slide provide one of the most complete experiences. Looks really good and enticing for children of all ages. Offers one of the most versatile and light designs for easier installation & transportation. The slide has a very small top landing, so younger children may have difficulty getting in the right position to safely slide down. The KidKraft Modern Playhouse is the best wood playhouse you will find. It is totally interactive, easy to install & use, and completely safe and reliable in its entirety. 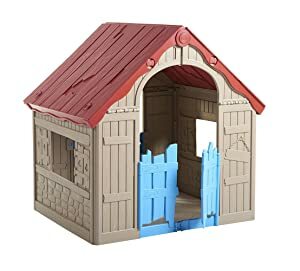 The wooden playhouse from KidKraft is an option for the demanding parents who want a higher-quality toy for their children, as it is not only perfect for its overall build but for the amount of creativity it promotes. The playhouse comes with a front door, a picnic table with two benches, an outdoor grill with a lid, and a mailbox. Your children will get a unique experience with this playhouse, perfect for promoting increased imagination in your back or front yard. When it comes to versatility, this house also has a lot to offer. It is spacious enough for up to 5 or 6 children to use it at the same time. Developing social and communication skills, as well as having a totally safe & entertaining experience. But the real deal of this playhouse is its durability and strength. It comes with wooden panels on each side, correctly put together, so it not only prevents breakage but also improves overall durability. What’s even better, the wood is one of the best for kids toys, which means it is resistant to wear, tear, warping, and even water. Not very large and the cedar wood smells really good. Very resistant and long-lasting wooden construction. Versatile & spacious design for up to 5 children to play together. Interesting wooden details and items for better playing experience. Does not hold together too well for moving or transporting. A backyard is all you need to make your children happy with the All-Around Playtime Patio Playhouse from Step2. It is easily one of the most interactive & entertaining choices in the market, perfect for children who are more curious and active. You will allow your child to enjoy a fantastic time while recreating activities such as cooking, playing with sand, eating, or just having a nice day in the backyard or the beach. It is excellent to make your child’s imagination fly and improve overall creativity as well. You’ll get everything from a restaurant to an exciting camping hut, everything you need to make your child happy. 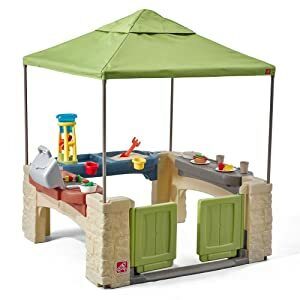 The whole design is pretty well-made; you’ll get a kitchen and a grill, sand with water play area, snack or dinner bar with several dishes, and a canopy-like design with the ceiling for a complete experience. It even holds up to 4 children inside, improving social and role-playing exponentially. You can set up the playhouse everywhere you want as well, and it will always provide a reliable & durable experience. 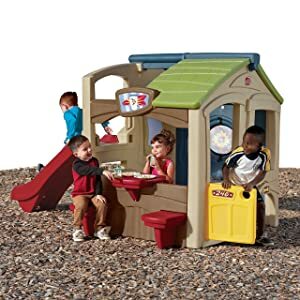 Whether it is one child inside the house or several kids outdoors, this playhouse offers everything your kid could need and more. The roof is a great option to get some shade during summer without being cooped up in a hot little fully enclosed playhouse. Reliable & durable construction for safe and easy use. Demands almost no offer to install and put together. Incredibly affordable for its size and overall quality. A wide array of interactive items and playing options. Only downside is that there is no drain on the “sink”. One of the most durable yet convenient designs in the market, the WonderFold is the perfect playhouse for parents who don’t want to waste any time assembling. It is the product that folds and unfolds whenever needed, offering a pretty and entertaining design for children of all ages to enjoy. The playhouse boasts two working windows, a Dutch door, and a barn door. You get a beautiful design resembling both a wooden house and a stable. It is made of the highest-quality polypropylene resin as well, so you get a durable and reliable experience for years. The playhouse resists all kinds of weather changes, water, sun, and even rust. But the real deal about this playhouse is its versatile design. It is one of the lightest and most compact in the market. And what’s even better, you can fit this house practically anywhere you want with its foldable design. Whether it is behind the bed, in a tight closet, or the trunk of an SUV, this foldable playhouse allows you to store it or take it anywhere you want without any issue. If you want a product that not only resists all types of weather and environment but that also helps to bring it anywhere more efficiently, the WonderFold is a choice you shouldn’t dismiss. Incredibly convenient and versatile light & foldable design. Looks really good with its wooden house theme. Polypropylene resin material offers a durable & resistant build for years. Lacks interactive items or objects to play with. A camping tent is never a bad option when it comes to getting a playhouse. It may not be the sturdiest or most durable of options, but surely one of the most entertaining to get for your children. 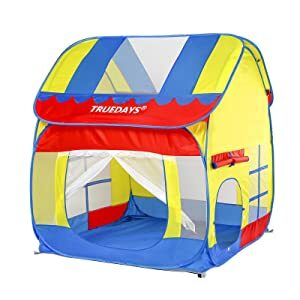 Especially for the little children, this polyester playhouse tent is a fantastic choice that you can take anywhere without issues. The tent comes with two tunnel doors in the front door for children to access inside in a different way. It also comes with several non-movable windows and a very reliable build that keeps children inside. The whole pole system is very secure as well, with a PU coated build. And if all this wasn’t enough, the playhouse looks really good, so children can be attracted to it more easily. This tent, however, has a thing that puts it above many other options on the list. It is the ability to be folded and bring wherever you are in the most convenient and versatile way possible. The tent just needs to be opened quickly when you reach your destination (garden, back or front yard, beach, camp, etc.) and that will be it. You won’t have to assemble for hours, just a few minutes and that’s it. Its inside is very spacious as well and fits up to three kids at the same time. You won’t believe how useful and convenient this playhouse tent really is, so you should really put it high on your list if you want a product that delivers value. Top-notch versatility & convenience with foldable polyester build. Camping tent theme allows a wide array of creative scenarios. Works anywhere from the yard to the beach and more. Not as durable or resistant as other playhouses. Want to help your baby have a fantastic time while learning motor skills & improving overall physicality? Then you need to pick the Clubhouse Climber from Step2, an excellent choice for demanding parents who want quality in every way possible. 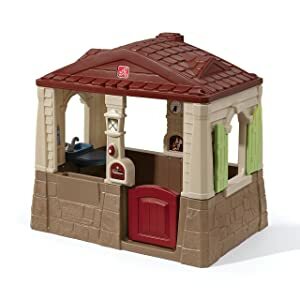 This is one of the most elaborate playhouses in the market. 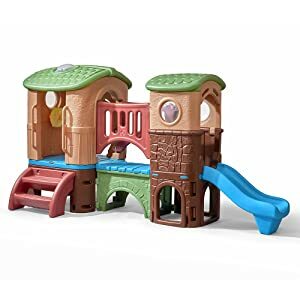 It comes with an exciting nature theme plus many interactive items, including a steering wheel, skylights, climber stairs, a bridge, and much more. Your children will have unlimited hours of fun with this option, and it will perform really well even under rain. The best of the playhouse is that your child can use it standing, crawling, or merely laying inside. It is one of the most adaptable options in the market, as well as one of the most convenient for children. And it is large enough to let up to 3 kids to crawl and creep inside without issues. From the color choices to the interactive design and even the whole versatile build, this design is just amazing to bring children to play safely & for hours. The best of all, it is made with one of the most resistant & reliable plastic builds in the market, so you can install it and put it anywhere you want to let your children play without issues. Excellent design for more convenience and versatility for children to play. One of the most enticing designs and color choices in the market. High-quality build works anywhere including yards, beach, and more. Sturdy, long-lasting and resistant construction. The huge build can make it troublesome to transport or move when needed. Playhouses are some of the most expensive toys you can buy for your children. They are also one of the largest and most uncomfortable, and sometimes they are even hard to maintain or keep in neat states. It can be preoccupying when you see your kid never go out and play, especially at a very early age. But with the right playhouse, this can be eliminated entirely. This way, he improves social skills, mental and physical capacity, and even develops essential health improvement if he didn’t. Not only because toddlers are less likely to go out and play than bigger kids and teenagers, but because with today’s internet and electronic devices, children are more likely to prefer indoor play than outdoor. However, with the right playhouse, you can make your children go play outside and encourage him to enjoy it without having to see it as a rule or obligation. The playhouse surely comes with several activities to do, as well as with a preset thematic. Nonetheless, there’s nothing better for a child than to create his own world to play in. This imagination product helps enormously with creativity, making your children more intellectually capable in the long term. What’s even better, it helps with communication and social skills (even more), when using imagination and creativity while playing with other kids. Some kids also develop negotiation skills and critical emotions this way. So you could say an outdoor playhouse is a perfect toy that helps to kid in child development. Now that you’ve read ten different playhouses reviews, it is time to pick the best playhouse that your children will love. One of the things that makes a playhouse more entertaining and useful for children is the number and quality of details and items it comes with. The more interactive theme-related stuff the house offers, the more likely it will help your children not only to be entertained but also acquire and develop new skills in the process. So pick one with several interactive items to play with, it will help your children a lot. Want your children to feel immediately thrilled by the playhouse? Then pick one that comes with interesting colors and playful design. This way your children will love the playhouse for its looks, and probably feel even more seduced to use it. There’s no use to pick a playhouse that looks good if it doesn’t resist the passing of years and heavy use. We recommend always going for a product that stands and holds for years. This means picking the sturdiest and most resistant product there is. Unless you want more versatility than strength, the ideal playhouse is the one that resists the most. Cleaning and maintaining the playhouse in a good stand is essential for the safety of your children and the durability of the product. We recommend going for options that are easy to clean and at the same time need no significant maintenance or care. This way, you can be sure of buying the right product that lasts and provides a safe experience for your children without taking too much of your time. Want to learn more about playhouse? Then come read the most common questions from users. Q: What’s the most durable and resistant material for outdoor playhouses? A: For us, there’s not really a material that lasts or resists the most. However, we always recommend wooden playhouses and molded plastic ones. These will last and withstand more weather changes and sun than others. Q: My children are below two years old, can they use these playhouses? A: Most playhouses are oriented towards toddlers between the ages of 2 and 6. However, they are safe enough for children below two. But, it is crucial the kid knows how to walk alone and have sufficient balance to avoid accidents. Q: Can I take these playhouses to the beach or camping? A: An outdoor playhouse can quickly be brought anywhere you want without any problem. But as long as the build of the house permits it, otherwise it can be a really troublesome deed. So, are you eager to bring the best outdoor playhouse home to your children? Then don’t hesitate and pick the best option according to your needs from our list. Remember that a playhouse is not only a place to have fun but to learn & develop several skills, as well as to interact with other children or people. This will be a handy toy for your children, so make sure you pick the right product for a better and more fulfilling experience.